According to Gallup’s State of the Global Workplace report, conducted in 142 countries, only 13 percent of employees say they feel engaged at their workplace. This rather disheartening result means that actively disengaged workers (negative and potentially hostile to the organization they work for) outnumber engaged employees almost 2-1. A range of organizational factors affect employee engagement, but, according to Dr. Linjuan Rita Men, an associate professor of public relations at the University of Florida, there are four main ones: environment, leadership, culture and communication factors. Dr. Men elaborates, saying the four factors include “[w]ork environment such as job characteristic, pay, and compensation, organizational leadership such as a CEO’s credibility, organizational culture that emphasizes transparency, integrity and trust and organizational communication factors such as a two-way, open communication climate and effective communication channels.” In other words, employees expect to be paid well, to be able to trust and work with their seniors and peers, and to be able to express themselves without the fear of repercussions. Willis Towers Watson’s Communication ROI Study Report defines effective employee communication as both a leading indicator of financial performance and a driver of employee engagement. 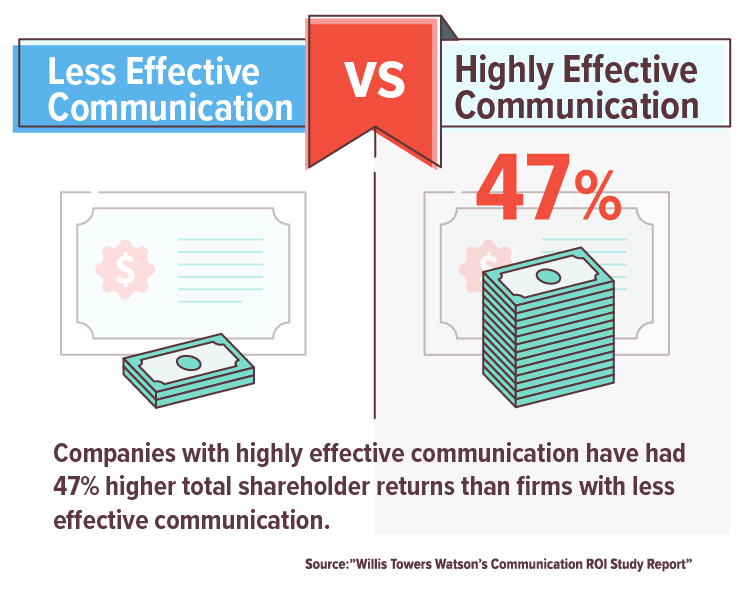 According to the report findings, over the past five years, companies with highly effective communication have had 47% higher total shareholder returns than firms with less effective communication. Another study by Willis Towers Watson, the 2014 Global Workforce Study, made similar findings. It concluded that, when employees perceive neither leaders nor managers to be effective communicators who drive engagement, only eight percent report high engagement levels. Conversely, at companies that utilize effective communication channels, 72 percent of employees report high engagement levels. As these studies show, an effective communication concept is the bedrock of successful employee engagement. How do we communicate internally? The firm Hollinger and Scott surveyed 100 communication professionals about the channels they use. The survey found the top three most commonly used channels to be meetings, intranet and e-mails. Posters and banners are the fourth most common, and video the fifth. The survey also found “employee engagement” to be the biggest challenge in communicating with stakeholders, meaning that typical communication methods no longer work effectively enough. In today’s quickly-evolving business environment, face to face meetings are too time consuming, posters and banners are not eye-catching for busy employees and internal e-mails can be lost in cluttered inboxes. Video is being hailed by many as the future of content. Its value as a communication tool continued to rise in 2017, its growth directly proportional to the expanding mobile phone industry. A Cisco studypredicted that mobile video traffic will account for 75 per cent of total mobile data traffic by 2020. Video is becoming a critical information source for senior executives as well. According to a study conducted by Forbes, more than 80% of executives said they watch more online video today than they did just a year ago, and 75% of executives said that they watch work-related videos at least weekly. Why Video is so Powerful for Effective Communication? It is rich. One minute of video is worth 1.8 million words, according to Forrester Research. It is attractive. 54% of IC professionals say their employees expect video content, and 93% of them believe video has become vital to effective communication (according to Cisco’s Melcrum Study). It is practical. Video can convey a wide variety of messages for employees. It’s an ideal platform for conveying complex messages, training employees or sharing product updates. A picture is worth… As a medium, video most closely mirrors how we biologically consume information, since sight is our strongest sense. 90% of information transmitted to the brain is visual. We use vision to mediate 80% of our perception, learning and cognition. For large organizations that want to launch new material internally, video is unquestionably the most effective, efficient method. It engages people quickly and increases their understanding of the launch process by as much as 74%. Video also makes it easier to reach a variety of target groups. 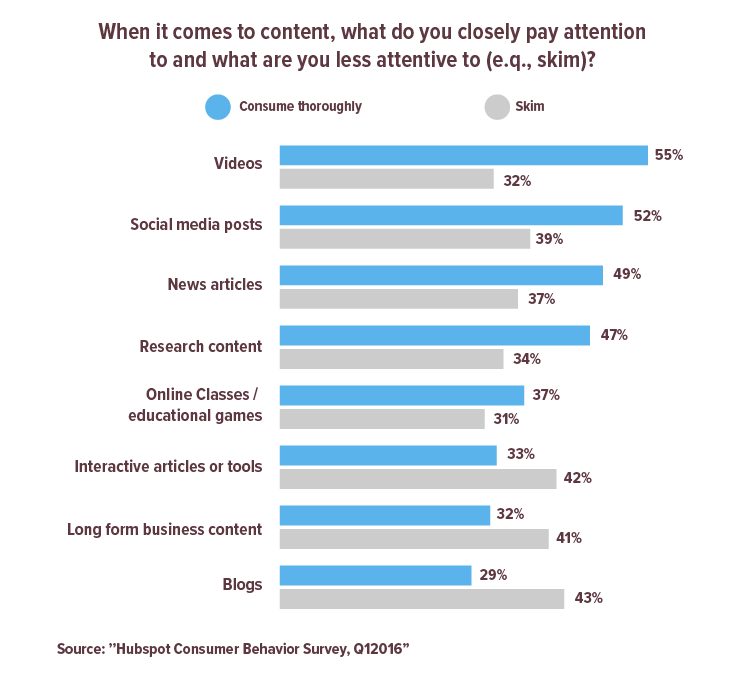 As shown in a consumer behavior survey conducted by Hubspot, video (55%) is the type of content to which people pay closest attention, followed by social media posts (52%) and news articles (49%). Thanks to their many potential uses, diverse video styles can be used to reach several target groups and address multiple topics at once. What are the benefits of motion graphics videos? A growing number of companies have started using motion graphics videos to enhance their employee engagement. Boston Scientific used a series of short videos to tell employees about the launch of a new CRM assessment tool. Panasonic used videos to inform its employees about a new digital application called “On4Care.” According to Ylvi Buza of Panasonic, “Panasonic has seen customer participation and usage of the platform increase to five times as much [as before].” Vodafone, the British telecom company, has a similar story. They used video to explain and promote work-from-home options for employees. Koc Holding, a Turkish conglomerate, promoted its new benefits program, Flextra, to twelve different corporate groups via a three-minute explainer video along with a five-minute “how to” video. IKEA used an animated video to improve engagement with the “internal architects program.” Such examples will soon be found worldwide. 1. Less is more. Don’t exceed four minutes, since research shows that people rarely watch longer content. Achieve this by keeping it simple: stick to your core idea and remove any unnecessary information from your script. 2. Use storytelling. Explain core ideas (or ask your copywriter to do this) via stories and examples, since this dramatically improves information retention. 3. Use live action for very short videos, animation for longer ones. If a video has a runtime that’s under 30 seconds, you could probably record it on your mobile phone and still succeed. Longer videos—or those about more crucial topics—, require post-production and animation strategies to ensure engagement. 4. Find a vendor that specializes in producing videos for employee communication. If you have budget constraints, digital agencies may not be ideal partners. Start-ups like Vibons or Visually are good examples of more affordable, agile companies. Given a choice between a short video or a long e-mail, which would you prefer? In our social and personal lives, we tend to choose video for information or entertainment. We should take the same approach in our business lives. When it’s so easy to secure their attention with an engaging video, why should we continue to bombard employees with endless e-mails and meetings?